Once you’ve decided to publish your own books – eBooks and print books – there are a few steps you’ll need to do only once, to set up the relationships that you’ll re-use every time you publish a new book. Disclaimer: you need to make your own business choices, which you are solely responsible for; this page describes my advice based on my own experience, which may differ from yours. If you’re just starting out, you may want to write much of your first book before going to the effort and expense of these steps. That way, you can concentrate on the most important part of your business – creating a product – before thinking about the details of the business. You can publish your Kindle book without an ISBN. The publisher will be listed as Amazon rather than you. You can publish your CreateSpace paperback using an ISBN provided by CreateSpace. The publisher will be CreateSpace rather than you. Your publishing company checking account. Your publishing company’s login at your country’s ISBN agency (e.g., Bowker in the USA). A KDP Account (which uses the same login/password as your Amazon account). A Smashwords account – if you wish to distribute through Smashwords. A CreateSpace account – if you wish to publish a paperback edition of your book through CreateSpace. An account at each distributor’s Author/Publisher site (such as Nook) – if you don’t distribute through Smashwords. Every eBook you publish will have a publisher. That publisher can be either yourself, a business you create, or a third party publishing service. A lawyer who specializes in small businesses can help you decide which will work best for you. That lawyer can also, for between $500 and $1,500, help you create and register your publishing business, and set you on your way to keeping the proper paperwork for that business. Your State will likely have a small annual fee (for example $100) to maintain your company listing with the State. For example, I chose to set up a publishing business to separate my personal identity and finances from the identity, finances, and liabilities of my publishing business. I hired a local business attorney to help me create “Blue Paper Technology LLC” as my consulting and publishing business, registered with the State of Oregon. As a result of creating your business, you will request an EIN (Employer Identification Number) from the IRS. You will use the resulting EIN – in place of your Social Security Number – when you create your business checking account and when you set up a relationship with a distributor, such as Amazon. Once you’ve registered your publishing company, you’ll want to open a bank checking account for your company. This checking account will be where distributors, such as Amazon, will direct-deposit your royalties (profits) from your books. Note: as of this writing, Amazon and others will deposit funds only into a bank account, not a credit union account. You may also wish to create a credit account for your business, so that you can more easily keep track of business-related expenses (for example, buying ISBNs) by using your business credit card for such expenses. The name, address, phone number, and EIN of your publishing company. The checking account information of your publishing company’s checking account – that is, where Amazon will direct-deposit your royalties. Distribute your eBook through each distributor separately. For this alternative, you’ll create an account on each distributor’s author/publisher site, and possibly create a different ePub file tailored to each distributor. The advantage of this method is that 1) you don’t pay royalties to Smashwords, and 2) you have better control over how your eBook appears and is advertised on each distributor’s platform – for example, inserting links to your other published books in each book. If you plan to distribute your eBooks through any distributor and format other than Amazon Kindle, each of your eBooks will need an ISBN: an International Standard Book Number. An ISBN is a unique identifier of a particular edition and format of a book. For example, your digital (eBook) and paperback versions of your book will have different ISBNs; the eBook ISBN will be the same regardless of what company you distribute the eBook through; the same is true of your paperback edition and your hardback edition. I recommend buying ISBNs from the ISBN agency for your country, as assigned by the International ISBN Agency. For the USA, that agency is Bowker. Note: other companies resell ISBNs; if you buy your ISBNs from one of these resellers instead of the International ISBN Agency for your country, that reseller – instead of your publishing company- will be your publisher of record for those ISBNs. Once you’ve found the International ISBN Agency for your country, your next choice is how many ISBNs to buy. ISBNs are cheaper in bulk: for example, as of this writing Bowker charges $125 for 1 ISBN, $295 for 10 ISBNs, and $575 for 100 ISBNs. You’ll need a few ISBNs even if you plan to publish only one book: each edition of a given book requires a different ISBN. For example, if you publish one book in digital format and paperback, you’ll need 2 ISBNs. It’s also relatively easy to burn one or two ISBNs when you make a mistake in setting up the publishing info of your first book. Bowker can help you choose how many ISBNs you’ll likely need. See their ISBN purchase page. Now that you’ve set up your publishing business, your distributor account(s), and purchased a block of ISBNs, you’re all set to publish your books! 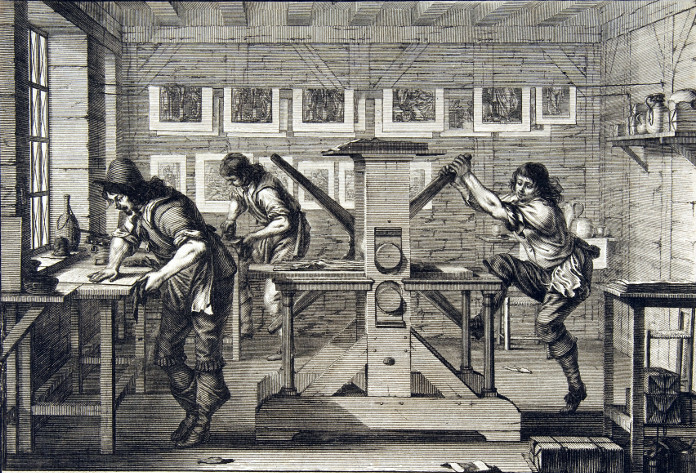 Featured Image: “The Intaglio Printers” by Abraham Bosse (detail). Public Domain image courtesy of the Metropolitan Museum of Art.